A set of commercial and / or non-commercial ads is placed both on a paid and free basis, depending on the specific site. Many advertising companies that have paper editions and work in the field of TV and radio advertising, create and maintain their own electronic bulletin boards. The leading site for free private ads. There was a merger with the other 2 leaders of the Runet Slando.ru and OLX.ru. Convenient communication between sellers and buyers to make the most profitable transactions, cooperation with leading information and social Internet-projects. Registration is not required, goods can be purchased quickly. Search by map, categories, everything is simple, clear, understandable. address: 196084, г. Санкт-Петербург, ул. Малая Митрофаньевская, д. 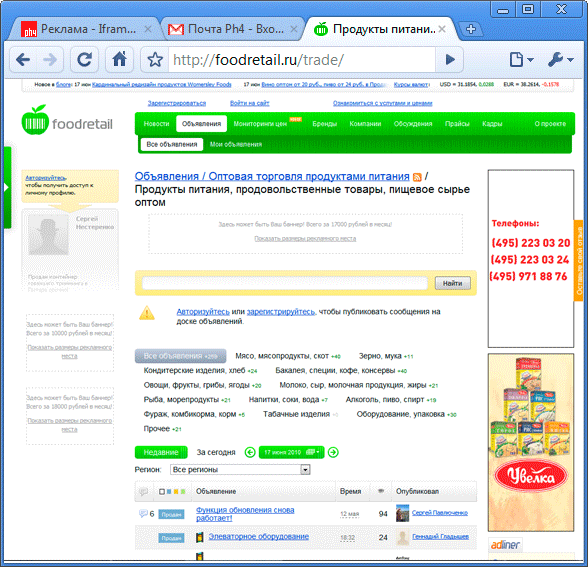 4 ООО "Инлайн"
Free bulletin board about buying and selling food and related products and services. News, analytics, catalog of companies. Bulletin board Yulia from Mail.ru. It is sold through phone and a site. We photograph the goods and at once we place. The main thing is quickly. In my opinion it is a little strange. And to edit a photo? Normally, a person does several frames, then he can cut them. And that can not really see what they are selling. Bulletin board about services, work, dating, cooperation, etc. a large number of sections and headings. the number of ads served is unlimited. The ad is on the board until you want to delete it. Each ad has a permanent address and can be indexed by search engines. Board free ads on services. This board is the leading platform on the Internet for offering services. The site is light, minimal design and text. Not difficult to search. Select the desired city and see the ads only by it. You can view the entire list, or you can use service filters. What we are interested in is clicking and receiving contact information. Of the shortcomings - no price. Because you have to choose a few and call. Board free private ads in Russia. Filter by cities and topics. But not always enough detailed filter. Let's say I need auto parts, which are offered ~ 1000 units in my city. So you need to look among this 1000. And I would like to filter by model and type of parts.